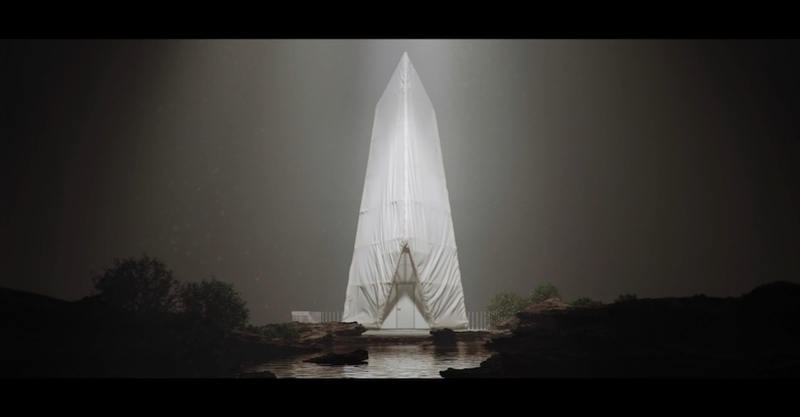 A white ephemeral monolith stands tall in "Northern Wisps", a CGI video by Bartosz Domiczek. Based on the project that won the Ronen Bekerman's Cabins 3d Challenge and CGarchitect 2018 3d Awards, Northern Wisps explores the relationships between built and unbuilt, natural and artificial, organic and abstract in order to create a creative tension, using CGI architectural visualization. No spoken word, no music is playing: Iceland, the setting for the Ronen Bekerman's submission, become a abstract landscape in the video. Here the cabins stands static, massive, formed as white ephemeral monoliths contrasting with the organic surrounding and confronting the daze, the wind roaring, the milky way shining in the sky. Looking like alien structures, the cabin are something between the reminiscence of the ancient dwelling built around the fireplace and the idea of Nordic gods standing in the row on a mountain ridge. Can CGI inspire the architects to create the buildings of the future? Being both an architect and an arch-viz artist, Domiczek is trying to incorporate more of this in his work, spanning from video to various personal projects (not all architecture-related). In "Northern Wisps" he tells the story of the unbuilt space without any pragmatic reasoning, but rather through the juxtaposition of shapes, materials to create "pure" emotions. "Northern Wisps" thus is a clever example of his approach: after winning the competitions, the revisited the projects in order to create a video, making it much more abstract than the original (the original series of images were said to be placed in Thorsmork, Iceland while the spacial aspects in the video are much more non-specific and a bit dreamy). Will this kind of action be the future of architectural visualization? Maybe only time will tell, but following the work by Domiczek we may foresee it.